In addition to our full Supply and Fit servcie, we can also offer you a professional Supply Only and Supply and Fix service for our Aluminium Bi-fold Doors. Supply Only - here we will deliver you bi-fold doors to site only. Note: all Supply Only Products are supplied with the manufacturers warranty only. 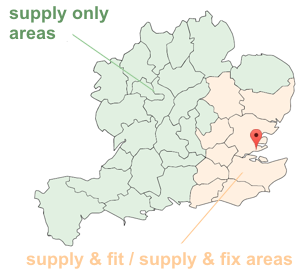 Supply and Fix - this service includes a site survey where by we attend site. This is a fixing service and is not a full fitting service. It is aimed at customers who are happy to do sealing, plastering etc. We fix the doors into the builders aperture and ensure they are working properly. We do not make good so this service does not include (and not limited to) mastic, sealing outside, plastering, rendering, making water tight, removing existing doors or preparing the hole and we give a 12 month warranty on this service. It is a cheap basic service to get the doors fixed correctly. However if you do not have a builders opening or wish for a more comprehensive retail service with 10 year warranties and certification then we can offer a full Supply and Fit service. The areas that we service in the UK with our own team of experienced filtters are Essex, Hertfordshire, London, Middlesex, Kent, Surrey, Sussex, Suffolk and Cambridgeshire. Bedfordshire, Berkshire, Buckinghamshire, Cheshire, Derbyshire, Devon, Dorset, Gloucestershire, Hampshire, Herefordshire, Leicestershire, Lincolnshire, West Midlands, Norfolk, Northamptonshire, Nottinghamshire, Oxfordshire, Rutland, Shropshire, Somerset, South Yorkshire, Staffordshire, Warwickshire, Wiltshire, Worcestershire. Normal delivery on our standard White 9010 gloss or Std Dark Grey 7016 Matt finish Smarts Duraslide 1000 and Beaufort Continental is 3 weeks from date of confirmed order. KL colours depending on stocks would be approx. 4 - 5 weeks from date of confirmed order. An RAL colour would be approx. 6 weeks from date of confirmed order. Blinds would be approx. 6 - 8 weeks from date of confirmed order.